Below is a collection of publications, reports, public and legislative documents, etc., pertaining to or impacting The University District's formation, evolution and/or revitalization, as well as pertaining to other key partner organizations in The University District and downtown area. Note: UDPDA stands for University District Public Development Authority, UDRA stands for University District Revitalization Area. 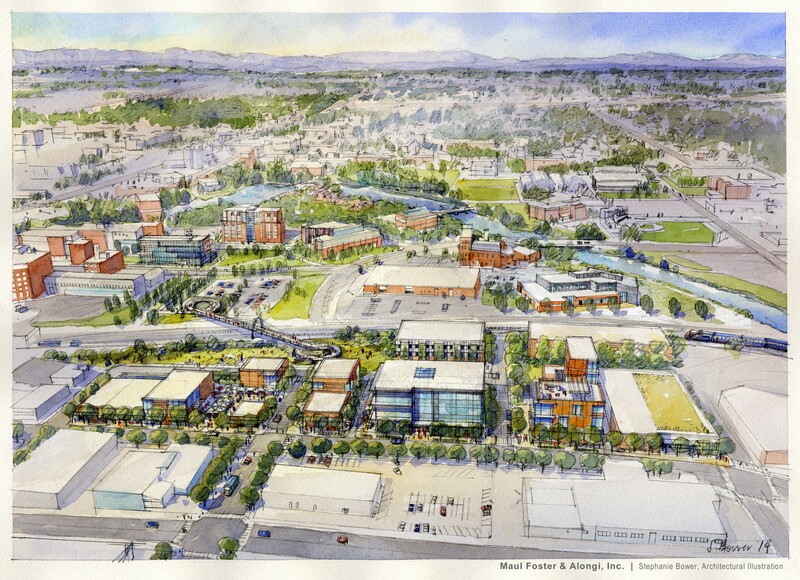 Spokane’s University District is seeking a firm with expertise to implement the attached RFP. To ensure the University District continues to serve the needs of the community and guide anticipated growth and development within the area over the short- and medium-term, the City of Spokane and the University District Public Development Authority (UDPDA) are jointly pursuing a limited scope update to the 2004 University District Strategic Master Plan (UDSMP) and the preparation of a south Sub-area Plan. The UDSMP update will set the stage for sub-area planning within the University District by providing focused attention to the development potential and challenges facing key areas. The first sub-area plan will draw upon the current initiatives already underway within the area and set a framework for sustainable economic growth and investment and removing barriers to development. 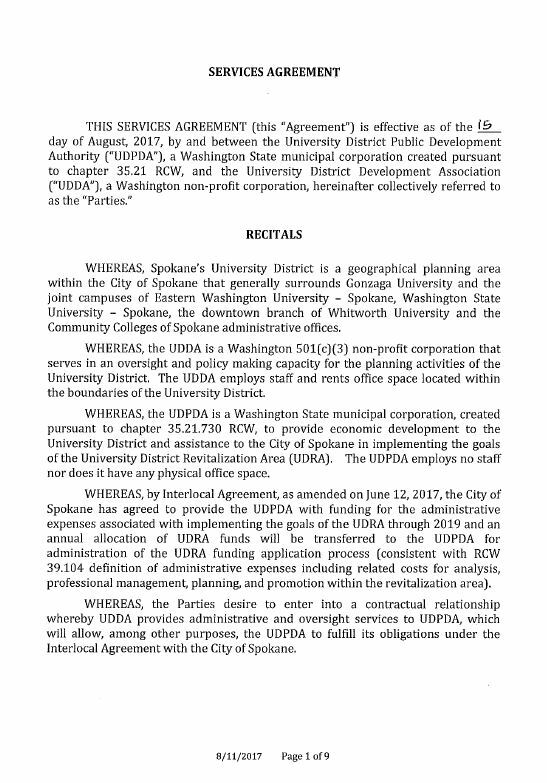 The University District Development Association (UDDA) is contracted to operate the UDPDA and will be managing the RFP selection and subsequent contract. Your firm is receiving this notice because you have registered your interest in providing professional services in Spokane. This RFP process will be fast paced and time sensitive so the timeliness and relevance of the proposals will be valued over their length (maximum 20 pages). The successful firm will demonstrate willingness and expertise to draw on past and current University District plans and partners for the best possible planning outcome. Please do not hesitate to contact us if you have any additional questions re the RFP. This brochure provides an at-a-glance look at The University District's philosphy, approach, infrastructure investments and financial incentives for developers. In 2015, the Downtown Spokane Partnership, the Parking and Business Improvement District, and the University District Development Association engaged Applied Development Economics, Inc., to prepare a city-wide residential market analysis and economic report. Findings from the study include: •The City is skewing both older and younger and housing trends will cater to both retiree and university student needs •The growing student population will drive new and more unique retail, entertainment and dining alternatives for all •Local household income growth will bring more shoppers downtown and cement Spokane’s role as the regional retail hub •Re-used and re-adapted buildings will be popular; look for mixed-use renovation projects with ground floor shops and upper floor living •The partnership strengths among WSU’s new medical school, other local universities with health science programs, area hospitals, and existing Spokane life sciences companies, will be a major economic driver in the area resulting in new jobs, spurring wage growth and improving the overall quality of life for Spokane residents Please let us know if you have any questions or feedback on the study. We welcome your interest and input. The Board of Trustees approved Gonzaga’s Strategic Plan July 17, 2015. President McCulloh and the President’s Cabinet are appreciative of the efforts of the University Strategic Planning Committee in advising upon and shaping this plan. Revisions to the plan were introduced to, and approved by, the Board of Trustees July 6, 2016. This is meant to be a “living plan” that will continue to evolve, as does the University and its opportunities. Gonzaga leadership looks forward to engaging the campus community around this plan in the coming academic year. Read the document http://issuu.com/gonzaga/docs/gonzaga-strategic-plan/1?e=1311295/38434204.